McLaren shows us more skin of its upcoming Grand Tourer as it removes some of the camouflage for a better view. 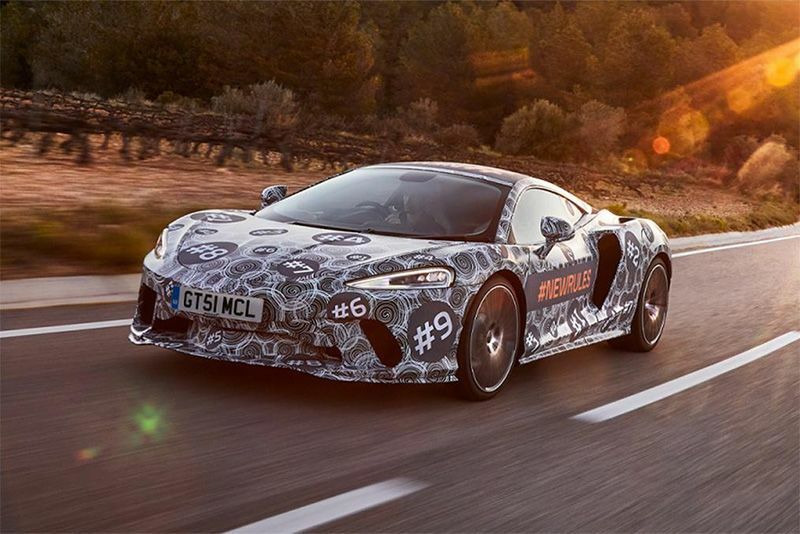 Considering these pics are from Mclaren themselves, they're not exactly 'spy shots' but their upcoming Grand Tourer is still sporting enough camouflage to hide its important bits. That's not to say its latest dress isn't a little see-through, revealing the long, sleek, low and wide mid-engined supercar hiding underneath. There's a large front overhang, considering its GT designation, likely swallows enough luggage to not require Jeeves to follow in the Rolls. The headlamps are thin teardrops stretching along the front fenders while, at the back of the car, narrow LED tail-lamps sit between a ducktail boot lid spoiler and a rather deep diffuser. According to McLaren CEO, Mike Flewitt, the Grand Tourer will receive the same mid-engined, rear-wheel-drive layout as its siblings but will have the best power-to-weight ratio thanks to a twin-turbocharged V8 engine. Mclaren has also confirmed that its new unique, tailored GT will “share its DNA with the 250mph McLaren Speedtail” and will not form part of its existing model Series. There are plans afoot to test the new McLaren Grand Tourer over a 1,000-mile drive from their near Barcelona to its Technology Centre in Woking, Surrey, by two drivers and a full complement of luggage as part of its production testing. McLaren has stated that the GT's interior will be an uncluttered affair, with finishes equal to or better than their usual high standard and, according to Flewitt, "will be the most usable mid-engined car built to date". Miniature Formula 1 Grand Prix Idea Looks Fun, But Mostly Silly! Video: The Grand Tour Season 2 Montage Is The Best Yet!